NAPA VALLEY LIFE - The much anticipated opening of Vista Collina Resort has been the talk of Napa, and thus far, those lucky enough to sneak a peek have been wowed. Perhaps it’s the Tuscan-style architecture. Or maybe it’s the luxurious pool flanked by 10 cabanas. The nine tasting rooms that surround the spacious community lawn might have a little something to do with the wow-factor. It’s all these things and more that come together to create Napa’s newest luxury destination. 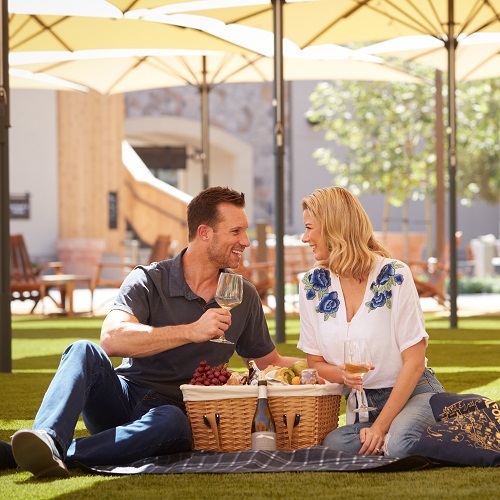 More than a hotel, Vista Collina Resort, located in South Napa across from sister hotel The Meritage Resort & Spa, presents a new format for discovering the bounty of wine country. With a focus on culinary and tasting experiences, Vista Collina Resort curates the best of Napa at its centerpiece “Village.” Nine tasting rooms encircle the large community lawn and feature some of the finest boutique wineries and microbrews in Napa Valley including Trinitas Cellars, Foley Food & Wine Society, Jayson by Pahlmeyer, Napa Smith Brewery, Luna Vineyards, GEN 7 Wines, The Wine Foundry, Cornerstone Cellars, and Mi Sueno. For those interested in further viticultural exploration, the resort’s shuttle service drops off and picks up in Downtown Napa.